Several years ago, I was demonstrating with the Central Jersey Woodworker’s Association at the Woodworking Show in Somerset, NJ, and had an interesting experience. I was preparing and carving a ball & claw cabriole leg, and had a lot of folks stop by the booth to ask questions about the wood and the process. As is common when I’m doing woodworking demonstrations with hand tools, several of the show attendees felt the need to let me know how much faster I could cut the mortises with a router as opposed to the mortise chisel I was using. However, as I continued my work while talking to them, their wise cracks soon turned to amazement as they realized the inaccuracy of their statement. Over the years, I have repeated this scenario over and over as I have demonstrated the efficiency of a properly tuned and employed hand tool. In most cases, I can start and finish chopping a mortise before I finish talking to the onlookers about what it is that I’m doing. Most of these folks couldn’t even find their router, the extension cord, and chuck up the appropriate bit in the time it takes me to chop out a single mortise. Still, there continues to be a misconception that hand tools have to be slow and inefficient. 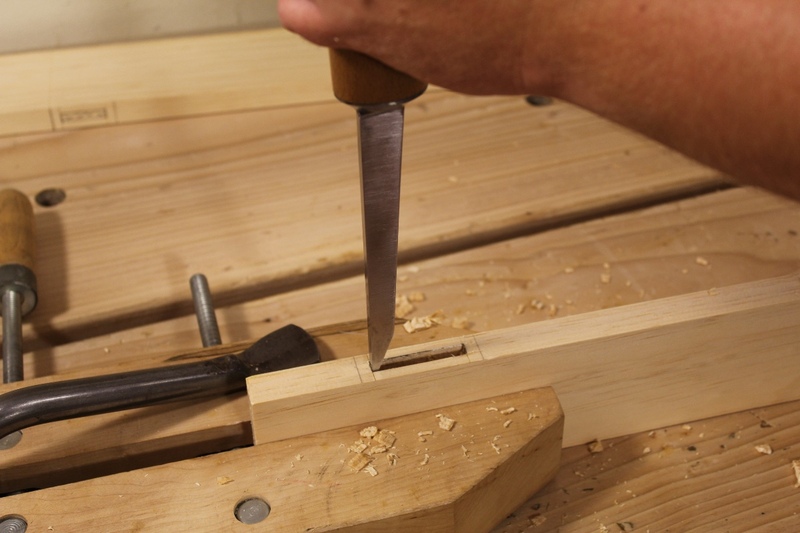 While it might be faster to use a router if you are making dozens of identical mortises, if you only have a few to make, it can be faster to chop them by hand. In some cases, it’s true that using hand tools would be kind of foolish. For example, I wouldn’t want to build an entire kitchen full of plywood cabinets using only hand tools. Batching out dozens of identical parts is a task that has been optimized for machine work. However, for the majority of woodworkers, especially those who take up the craft as a hobby, batching out multiples of the same project, or even the same part, is not all that common of an occurrence. In fact, just about everything we do is a one off piece, so the efficiency gained by batch cutting on machines is lost on the bespoke builder. Prior to the industrial revolution, joiners and cabinetmakers used nothing but hand tools to make their living. These craftsmen produced what was arguably some of the most beautiful and technically challenging furniture in the history of the craft, and they did so with unbelievable speed. In fact, many of them were capable of producing these pieces in less time than it would take most of us using machines. The speed at which our ancestors were able to work is a fascinating topic. It’s one of the reasons why we study the old methods and antique furniture. We become not only woodworkers, but archaeologists as well. We look for any clues we can find, either through research or through experimentation, that will shed some light upon how our pre-industrial forefathers worked and why they made the choices they did. Old shop account books are great resources for estimating the amount of time that it took period woodworkers to build a typical piece. We know from various sources what a typical journeyman’s wage would have been during a particular time period. Based upon the standard wages and the prices charged for different furniture forms listed in books like the 1766 account book from the Lancaster, England firm of Robert Gillow, we can estimate how much time it took to build different pieces of furniture during the period. A simple chest of drawers from the account book of the Lancaster, England firm of Robert Gillow. Mack Headley, the retired master of the Anthony Hay Cabinetmaker’s Shop in Colonial Williamsburg, wrote a fantastic article for the 1999 issue of American Furniture that goes into great detail on the workings of different shops during the 18th century. 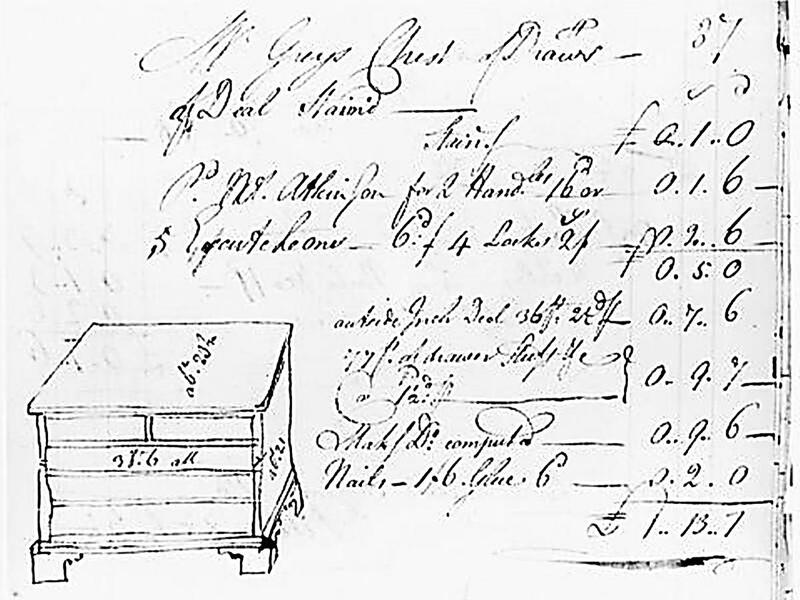 The piece pictured above is a simple chest of drawers from the Gillow account book. Based upon the price for this piece given in the book, Headley estimates that the piece would require approximately 66 man hours to complete, including finishing. So period cabinetmakers could build this chest from rough sawn lumber to a point ready for finish, completely by hand, in about 5-6 modern work days (3-4 18th century work days). It’s clear from estimates like these that period craftsmen were extremely fast. This begs the question, though, how did they manage to work so fast? We can make some educated guesses based upon other historical information, experimental archaeology in our own shops and those like the Hay shop, and by inspecting old furniture in museums and antique shops. Some of the answers are easy. Others, aren’t so obvious; and often our search for answers only leads to more questions.